One of the worst things about living with cats is dealing with their nasty litter box. When you don’t clean it up regularly, your cat’s waste can pile up and leave a terrible mess and awful smell to your home. An innovative solution, the CatGenie provides the very answer to this problem. It’s an automatic, self-flushing and self-cleaning cat box that’s basically your feline’s toilet, giving you utmost convenience and keeping your home clean and odor-free from your cat’s waste. 4 Who Is it Good For? 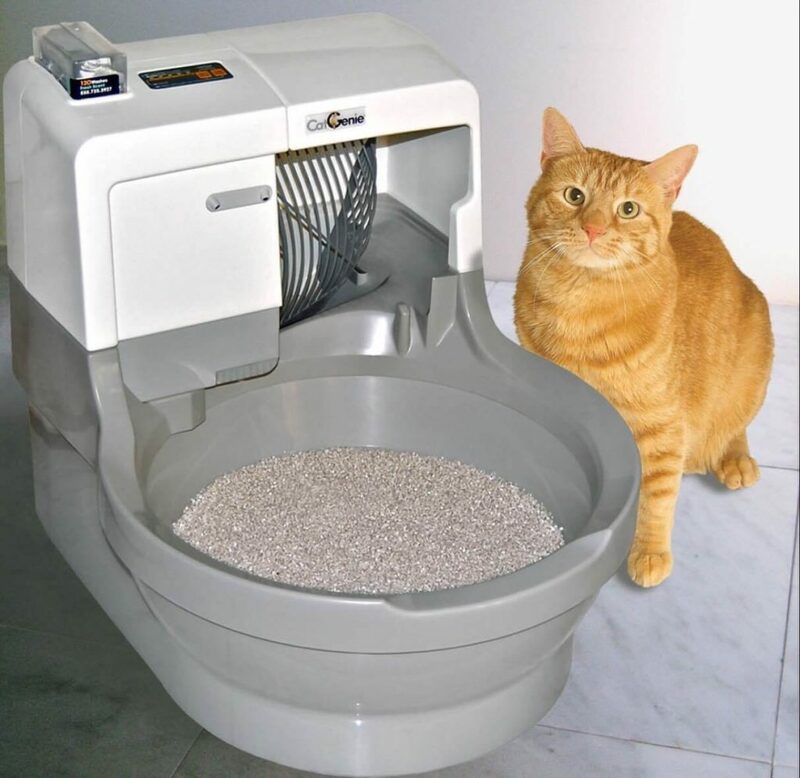 You can place the CatGenie in your bathroom next to your toilet or in a laundry room next to a washing machine. All you need is a cold water line where you can attach the cat box to. Looks just like litter, these granules are dust-free and completely washable. You won’t have to buy litter at all since these granules can be used again and again. The granules are also biodegradable within 9 months which means they won’t cause problems on your septic systems. When your cat urinates, the liquid is drained through the granules, goes through the bottom of the tray, and through the drain pipe. When your cat defecates, the cat box scoops out the poo, goes through the SaniSolution cartridge, and gets flushed out. Once this process is done, CatGenie washes out the granules with cold water and sanitizes it, dries them, and after about 30 minutes, the cat box is ready to use again. You can use cat litter deodorizer to get rid of strong ammonia smell. 1. Cat Start – the box automatically flushes and cleans itself after 10 minutes of your cat defecating. 2. Auto Start – you can program the box to clean itself 1 to 4 times a day. 3. Push Start – this is the setting where the box flushes and cleans itself when you press the start button manually. 30-minute Cleaning Cycle – the cleaning cycle is pretty long and noisy, too. If your cat needs to defecate within this time period, then things can get messy. Soft Poo Gets Left Behind – CatGenie seems to only work properly for firm poo. Soft poo often gets left behind and when the cat box automatically cleans and dries itself, the poo can get baked and end up smelling incredibly awful and disgusting. 1 to 2 adult cats and not more than 3 average size cats that are 6 months and older. So if you have one or two cats, the CatGenie is perfect for you. The unit needs to be cleaned and maintained at least 4 times a year to prevent buildup and clogging, so some actual cleaning is still required to keep CatGenie working properly. If you’re not the type to do maintenance tasks, then this isn’t for you. Cats normally don’t adapt easily to new systems but when the CatGenie is introduced properly, it’ll be easy for you and your pet to become accustomed to using the cat box. CatGenie is great product that can make your life with your beloved cat so much easier and stress-free. Cleaning up after your pet can be a pain in the neck, especially if you’re busy with work or your personal life. 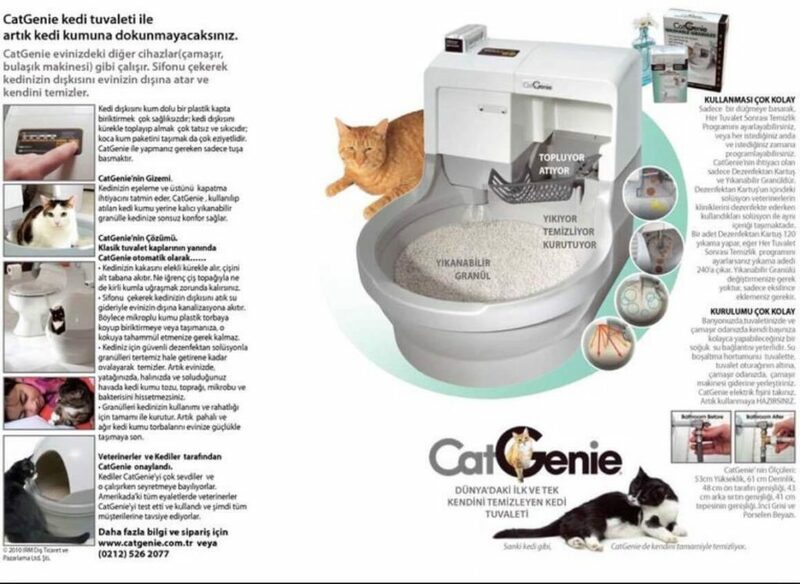 CatGenie is basically a cat toilet, and the fact that it sanitizes and cleans itself up is a fantastic feature. Like most things, CatGenie is not free of flaws. Soft feces can end up being broken to smaller pieces and getting left behind, which can cause you to clean it up manually. And worse, if you don’t notice the poo that wasn’t scooped up, it can potentially stink up your entire home since the poo will essentially be baked due to the unit’s drying process. If you want to live a stress-free and waste-free life with your cat at home, the CatGenie might just be the solution you’re looking for. Also visit home page and read about cat diapers for spraying! Cat Litter Deodorizer – If you Can’t Get Rid of Strong Ammonia Smell?